Leftist Latino activists started a petition last week seeking to bar leading Republican presidential candidate Donald Trump from holding a campaign rally at West High School in Sioux City, Iowa on Tuesday. Trump supporters are accused in the petition of having “accosted and attacked immigrants outside Trump events” in Ames and Dubuque. Pro-illegal alien activists have disrupted recent Trump rallies in Richmond, Virginia and Miami, Florida. Low-grade violence broke out at the events between the protesters and fed-up Trump supporters prompting the protesters to be ejected from the rallies by organizers and police. Trump has shown patience with the disruptive protesters, saying, “That’s why we have freedom of speech,” to the crowds. However, the Hill reported that Trump’s tolerance wore down after repeated disruptions at the Miami rally. The Sioux City school district quickly addressed the petition, stating that the Trump rally would go ahead as scheduled. That prompted an effort to organize a large protest at the rally Tuesday evening. The petition, started Thursday on the MoveOn site was initiated by Ismael Valadez, of South Sioux City and his nephew Francisco Valadez who is a 2012 graduate of West High School, reported the Sioux City Journal. Over 1,200 people have signed the petition which has a goal of 2,000. The Valadezes are organizing a protest at the Trump rally that has garnered over 800 RSVPs on Facebook, according to the Journal. “Ismael Valadez said he envisions a “silent protest rally” on the school grounds when Trump speaks at 6 p.m. He said the goal will not be to get into a war of words with Trump supporters. “”Most schools are working hard to try to prevent bullying in their institutions,” Ismael Valadez said. “Donald Trump is a bully and doesn’t belong in Iowa schools. His anti-immigrant rhetoric is inciting violence toward Latinos across Iowa and across the country and puts Latino students in danger. 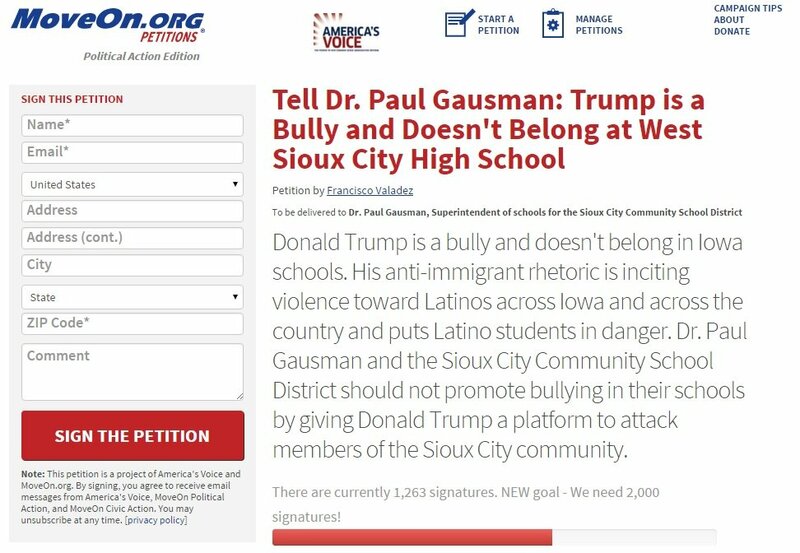 Dr. Paul Gausman and the Sioux City Community School District should not promote bullying in their schools by giving Donald Trump a platform to attack members of the Sioux City community. “Donald Trump is a bully. He doesn’t belong in Iowa schools. However, he will be speaking at West High School in Sioux City, at 6:00pm, on Tuesday, October 27th. “Parents and students in Sioux City believe that Sioux City Community School District should not promote bullying in their schools by allowing Donald Trump to hold an anti-immigrant and anti-Latino event on their facilities. “Donald Trump’s anti immigrant and anti Latino rhetoric is dangerous for immigrants and Latinos. Trump supporters in Ames and Dubuque accosted and attacked immigrants outside Trump events. We fear that his rhetoric will put Latino members of the Sioux City Community in risk of being attacked as well. “Late last week, officials from Donald Trump’s campaign inquired about renting the West High School gymnasium for a political rally held on the evening of October 27. It is not unusual for a political candidate to request to use a Sioux City Community School District facility, if available. Secretary of State John Kerry rented North High School in 2004 for his presidential campaign, President Barack Obama rented Irving Elementary School in 2007 and 2008, and Sen. John McCain and former governor Sarah Palin rented West High School in 2008. “School board policy 1004.1 reads, “The District’s Board of Directors believes that school facilities are community resources intended to be used to the maximum, including making them available for non-school functions.” Following school board policy and past practice, the District approved the rental of West High School for Mr. Trump. As a District, we do not endorse nor support any political party or political candidate. We treat each rental request on a content neutral basis.